The Danbury takes the Brookfield wastewater discharge under what is called an Interlocal agreement. That agreement requires Brookfield sewer system users to pay per gallon for operations, plus pay an apportioned amount for plant improvements. In the early part of this decade, Brookfield has used about 3 percent of the total flows handled by the plant. Consequently, Brookfield users pay 3% of the improvements to the Danbury Publicly Owned Treatment Works (POTW). By the Interlocal agreement, Brookfield is limited to discharge an average of 500,000 gallons per day (GPD), that is 500 MGPD. Slightly more than half of the purchased plant capacity was used since 2006. However, this capacity limit is slated to decrease in 2022 to 380,000 GPD with a significant upgrade of the Danbury Plant upgrade that is slated to have reduced Phosphorus discharge limits. Note: The Interlocal agreement is slated to be updated with the decrease in the Danbury plant capacity in 2022. See the chart of historical discharges below. The annual outflow seems to ebb and flow with economic activity in Brookfield. Q: What is the system capacity? A: The instantanous flow rate of the pumps to Danbury is 2000M Gallons per day. The practical capacity is roughly 50% of that or 1000M, that is, a million gallons per day. Q: Can Brookfield send that quantity to Danbury for treatment? A: No. The InterLocal agreement with Danbury limits flow to 500 thousand gallons per day (MGPD) on the average. Q: With projects currently on the drawing board what is the danger of running out of capacity? No. There is sufficient capacity through 2022 with the current Danbury agreement and the current capability of the equipment. This Danbury agreement was re-negotiated. A signed agreement was executed December 2014. However, this is slated to be reduced in 2022, with a planned upgrade that will include new Phosphorus removal capability. Note: Danbury reports the regional plant is designed for a capacity of 15.5 million gallons per day (MMGPD). In 2016, the plant currently operated at 9 MMGPD. Danbury has estimated flows at 11.5 MMGPD 30 years out. A Danbury Plant Upgrade to remove phosphorus is slated reduce the plant capacity to this 11.5 MMGPD. Note: These planned and future totals should not exceed the capability of the equipment. A review of the infrastructure will be conducted after the expanded monitoring system is installed. 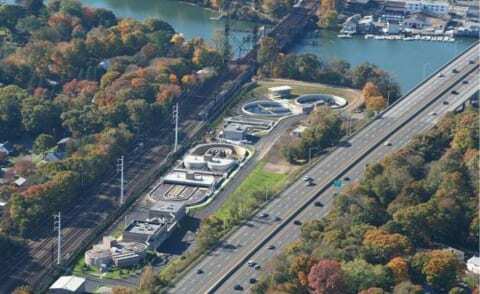 Separately, a Twenty-Year Plan study was completed to determine if additional capacity from Danbury will need to be increased from the current 500,000 gallon per day limit. This was an exhaustive study looking at all areas of Brookfield where sewers might be installed. It is not anticipated that addiitional treatment capacity will be needed for the next 10 years or so and maybe never.